When we left Chile and entered Argentina we witnessed the most rapid change of scenery – in matters of climate and geography. 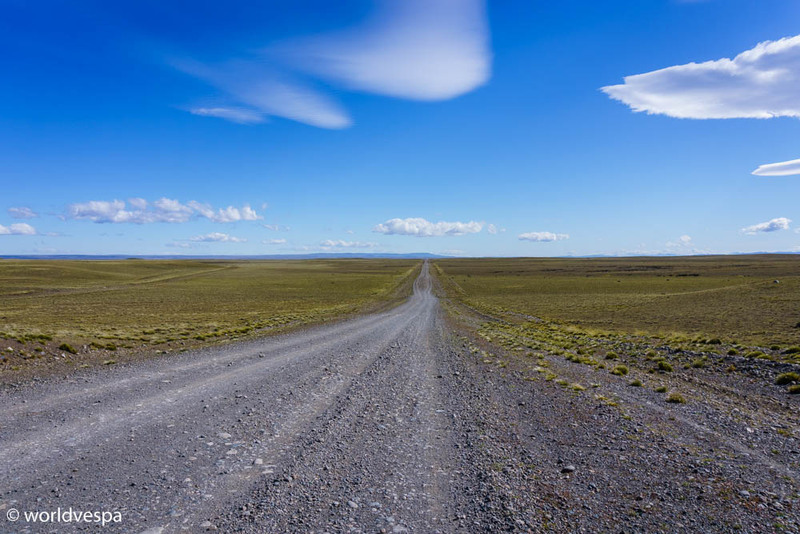 We were traveling on the road between the two countries and we could see the green color of the rich Chilean vegetation on one side and the brownish colors of the arid land of the Patagonian steppe on the other. 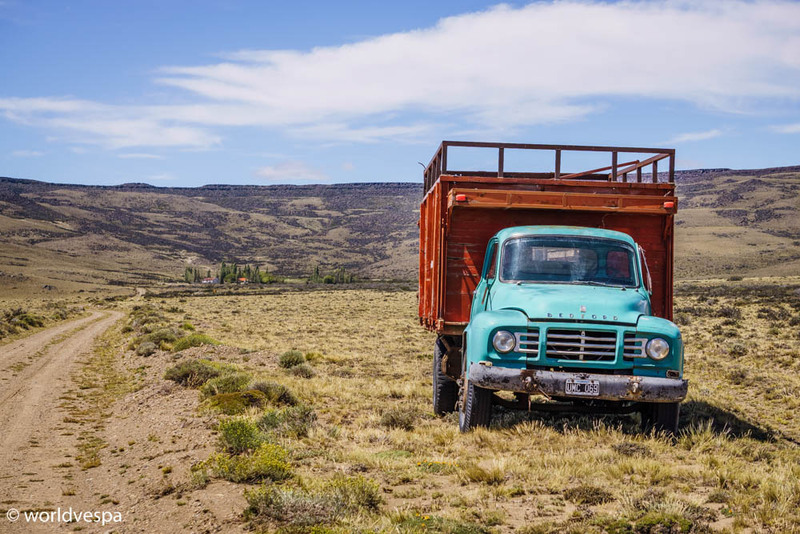 The last time we were in Argentina was several months ago, when we traveled across the country’s northwest province of Jujuy. The distance between the country’s north and its south is a bit more than 3,500klms. Consequently there are striking differences in the culture, the climate and the scenery. In most cases, there is more of a Patagonian common identity than an Argentinian one between the people of the South regions of Latina America. The plan for the night was to stay in Bajo Caracoles, a place on the Ruta 40 where there was a gas station and a guesthouse for travelers. We got there after 200 kilometers with strong wind, sun and low temperature. 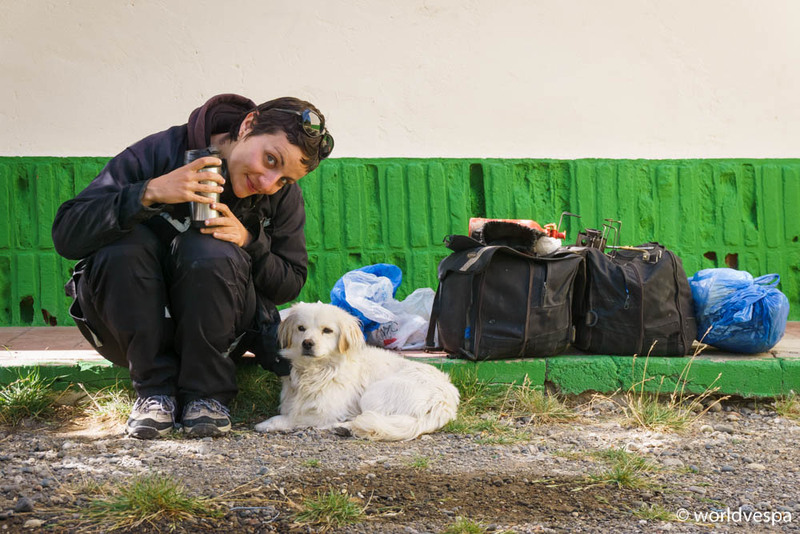 We had heard many stories about accidents due to the strong side winds in Patagonia and we were careful. The level of unease in such conditions, depends on the driver’s experience and skills, but under all circumstances everyone should be careful of the other vehicles. In Bajo Caracoles, we asked permission to stay in our tent next to the gas station. We pitched it next to a fence to be as protected as possible from the wind but soon, a camper parked next to us and provided us with extra protection. Surprises never end in life. The woman from the couple that got off the camper greeted us…in Greek! We turned around with a face of astonishment and she immediately explained that she was German and that she used to go to Greece for holidays. She admitted that the reason she first started learning Greek was not her love for the Greek civilization but her love for a Greek. The information that added some more exclamations of surprise, was that this first love was from a city very close to Stergios’ hometown. The couple – both of them really nice people, after we spent some time talking in Greek and in English, went to sleep. Before they go, they gave us a bottle of wine to celebrate this amazing coincidence. While we were also getting ready to go to sleep, another traveler came towards us. He was a retired policeman from the UK with an endless appetite for chatter. When he started giving us advice on how to overcome the Greek socioeconomic crisis, we got so tired that we couldn’t see the time to go! We were so fed up with all the “experts” reminding us what we did so wrong or with all those looking down on us only because of our nationality. Racism has many faces after all, and some of them are well hidden behind superficial compassion. 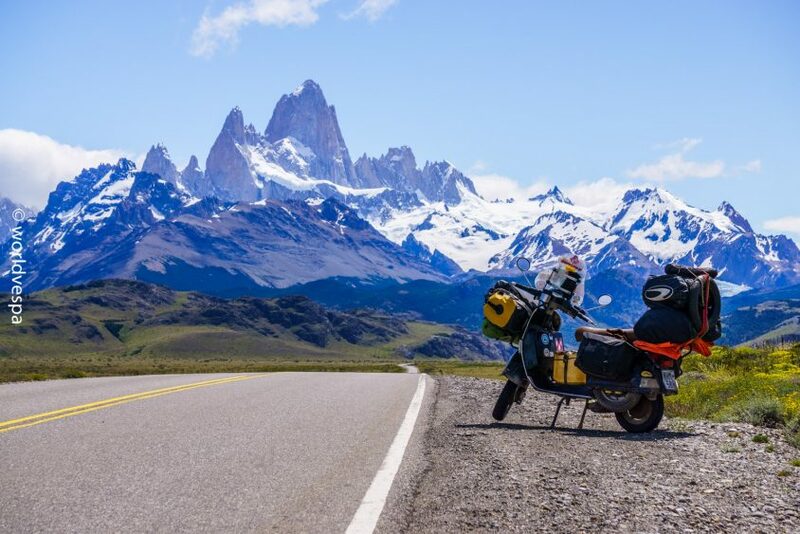 In the morning, just before we took off for our next destination, we met a group of Italian motorcyclists on an organized moto-adventure across Patagonia. When they saw the Vespa, they went crazy with excitement and since they had a professional photographer following them, they immediately asked us for some pictures. They were Italians, we were on a Vespa…Imagine, we couldn’t leave without at least a small chat first! That day we wanted to cover a distance of 400kms to the village Tres Lagos. 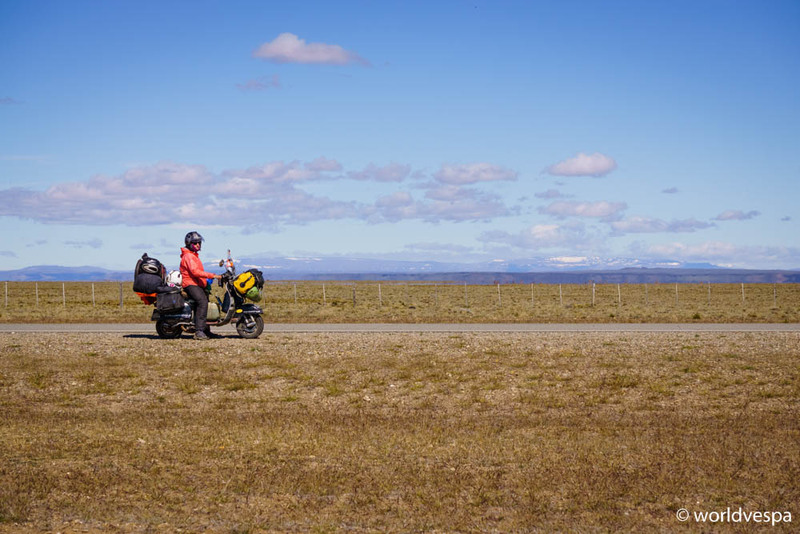 We had read many stories about lack of fuel in Patagonia and that gas stations are sparse, so with a 7lt tank and a 10lt jerrycan, we were not sure if we could make it. However, our previous experience had taught us that there is a percentage of exaggeration in many internet information, so we started with confidence! We also acknowledge that in cases of limited time and specific itinerary, lack of fuel can be a problem, but this was definitely not the case for us. We were right for once more. We made a detour and entered the city Gobernador Gregores, where we found enough fuel to continue without the slightest problem. We arrived at Tres Lagos late in the afternoon and we spent the night – where else? – at the gas station. We had never imagined how many travelers we’d meet from that moment on. All the places we visited were crowded and as we moved on to the South it became obvious that we were in one of the most popular places of South America. Our next destination was El Chalten, a small village near to the Mount Fitz Roy. While we rode towards the famous mountain peaks, we understood why this place was so much visited. We were lucky to see the peaks of Mount Fitz Roy with not even the smallest cloud hiding them. As we were told later, many visitors leave the place disappointed for not having had the opportunity to see the magnificent view. Clouds and fog can usually hide it for days. 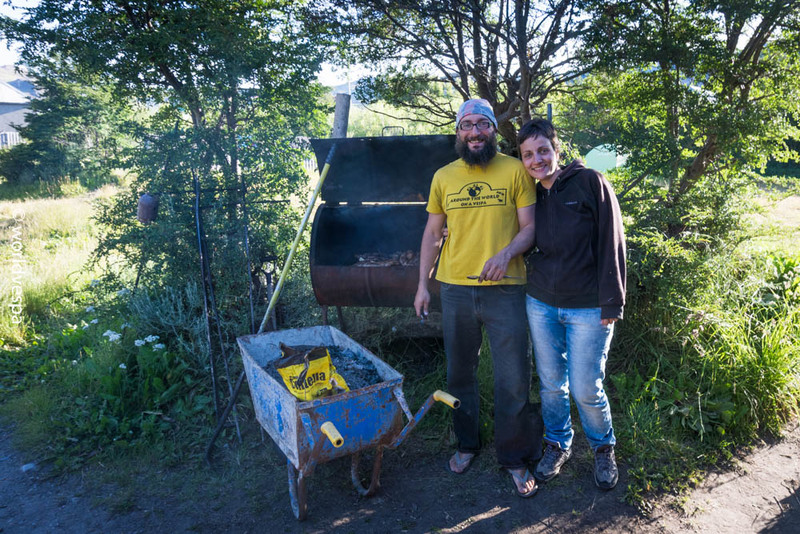 When we arrived at El Chalten, we immediately started looking for a place to stay. It was such a little village but with so many tourists, that we had serious doubts about the accommodation. It was obvious that this place relied exclusively on tourism. We could only spot guesthouses and hotels, restaurants, bars, travel agencies etc. 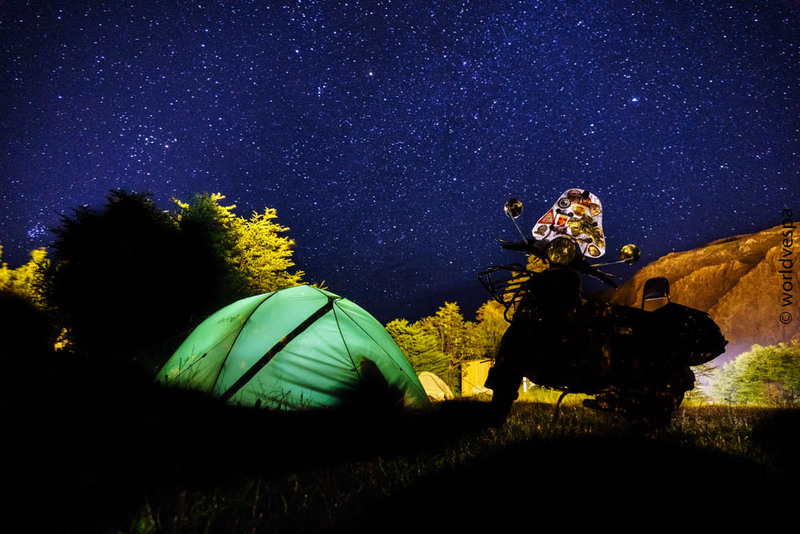 We did no wrong concerning the accommodation: overpriced campsites – I can’t speak of other types of accommodation, since we didn’t even check elsewhere. The first one resembled a car park and, as we were told later, it was something called a “party-campsite”. I’m not sure what it is, but I think I wouldn’t like it. The second one was so expensive that even the employee at the reception laughed when she saw our faces the moment we heard the price. We luckily found space to pitch our tent at the third one, but its facilities were poor and overpriced. What’s done is done though. We wouldn’t risk to find ourselves homeless during a 4-day holiday waiting for the New Year’s Eve. In El Chalten, we celebrated the coming of the new year twice – To clarify myself, we continue on the same year, we didn’t skip one(! ), it was that we preferred to celebrate in 2 different times: the Argentinian and the Greek one! This double celebration gave us the opportunity to eat 2 dinners and drink…well, a lot! We shared a table with travelers from everywhere around the world: Australians, South Africans, New Zealanders, Belgians, Italians, Swedish, Germans, English…How many nationalities around the table! However, although there were so many people, we had a feeling of loneliness. It is always interesting to get to know other cultures, but this time we didn’t speak the same language with anyone – and I obviously don’t mean the Greek language! Both Stergios and I couldn’t stop thinking about the two Basques and the Italian guy we had spent Christmas with at Puerto Rio Tranquilo in Chile. It was mainly the 5 of us back then, but we had something important in common: the sense of sharing. This time, everyone was looking at his own plate. No one offered anything to the other and even when we finished cooking and Stergios offered our barbeque fire to another guy, he looked at him with doubt and seemed that he couldn’t believe it. 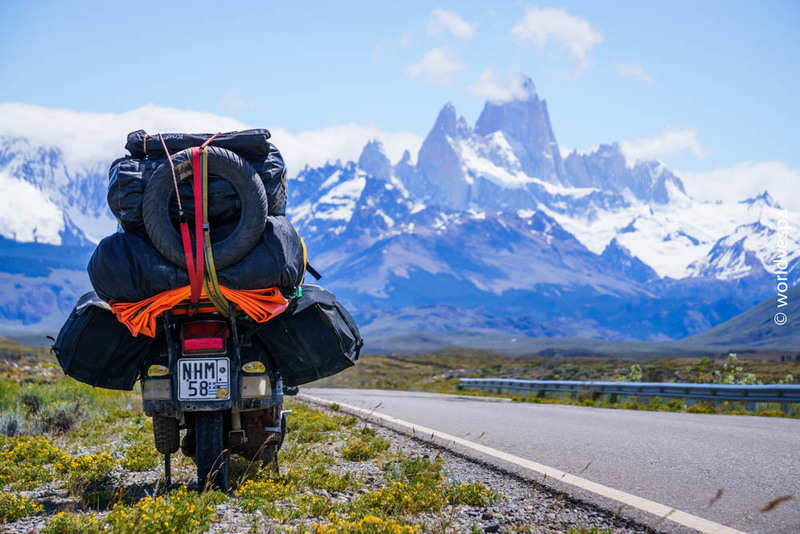 Mount Fitz Roy barely visible behind the…Vespa! January 1st, we allowed ourselves the luxury of going to a “chocolateria” and enjoy a cup of hot chocolate along with a chocolate brownie, a triple-chocolate alfajor (delicious Argentinian candy) and in general, enough chocolate for the whole year! We said we wouldn’t leave El Chalten without one hike at least to the lake Capri. We aren’t that much into trekking – our only serious trekking was the visit to Choquequirao in Peru, so we had decided not to climb Mount Fitz Roy. However, when we got ready for the short hike, the weather completely changed. Clouds hid the mountain and it started raining. The best excuse to avoid it! The next day we left El Chalten behind us and headed to El Calafate, the town near the famous glacier Perito Moreno. The glacier was the only reason we went to El Calafate, which is a touristic place as almost everything in the region. In El Chalten, we celebrated the coming of the new year twice. One in Argentinian time and one in Greek! During the Christmas and New Year’s holidays, everything was closed and we were a bit concerned about changing money. While we were away, some things had changed in Argentina. First of all, the government. Kirchner’s opponent, Macri won the election and became president. One of the first things his government did, was a big devaluation at the country’s currency along with the abolishment of the “Blue Dollar” rate. The Blue Dollar was an unofficial rate for the US$ and whoever had US$, could change them to ARS and take almost the double (officially: 1US$=8.9ARS BUT Blue Dollar: 1US$=16ARS). This common secret didn’t exist anymore when we returned to Argentina. So, to avoid searching for unofficial “casas de cambio” – money exchange offices and the commission they’d take, we went to the national bank of Argentina to buy ARS. Our 2-hour patient waiting in the queue was rewarded with 100$ extra! The cashier made a mistake and miscalculated the amount of ARS he gave us back for the 400$ we gave him. He returned us the equivalent of 500$ and we realized it about 3 hours later, when we were about to pay the entrance fee for the Glaciers National Park. As the bank is way richer than us and clearly wanted to sponsor our trip, we thanked it and entered the Park! 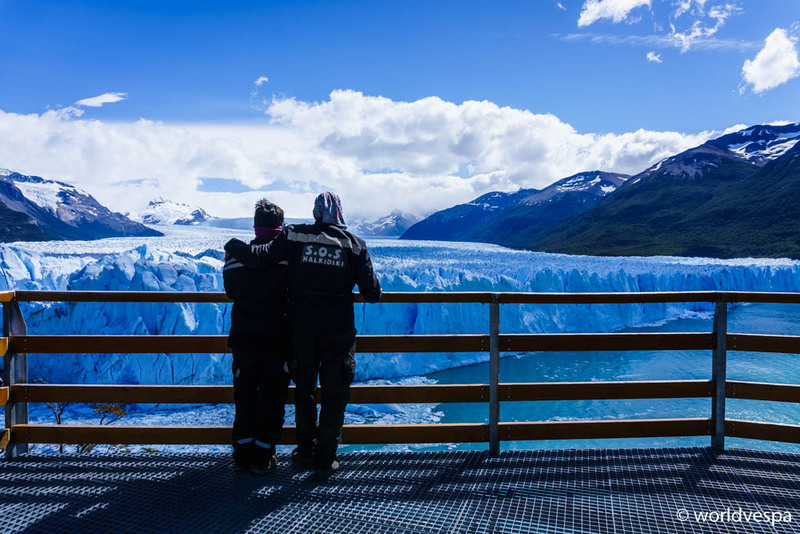 Being near the Perito Moreno glacier is quite an experience! We could pay again and again just to have the opportunity to see and hear the large pieces of ice collapsing into the lake Argentino making loud cracking noises! 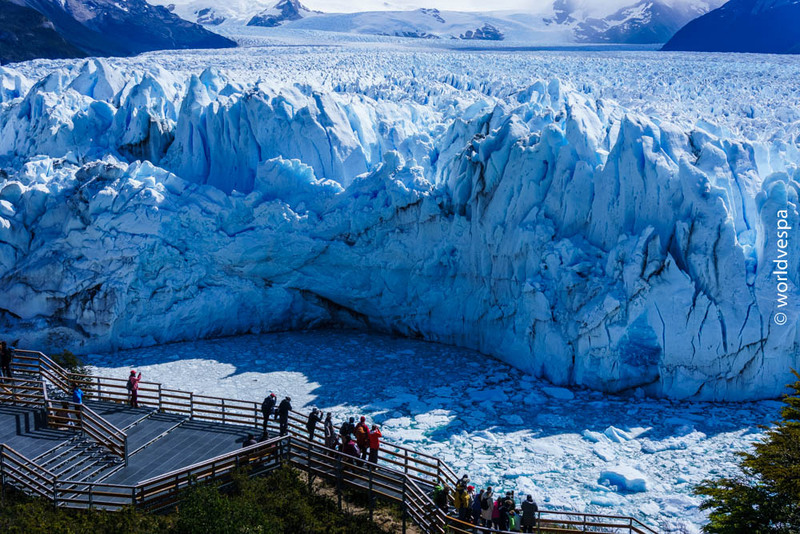 The Glaciers National Park (Parque Nacional Los Glaciares) was filled with visitors from everywhere around the world who had come to admire the 250 km2 ice formation. We parked the Vespa and followed the path to the terraces where the people can stand and watch the glacier. For several meters we were walking next to the lake and we could see big chunks of ice floating, so we were anxious to see at least one coming off the main body of ice. When we finally arrived at the end of the path and took a look at the famous glacier, we were utterly amazed! The Perito Moreno along with the other glaciers of Southern Patagonia are the world’s third largest reserve of fresh water. The unusual characteristic of this specific glacier is that it is advancing, while most glaciers worldwide are retreating and every less than a decade, a big rupture occurs due to the pressures from the weight of the ice. Of course, we had watched many videos showing large pieces of ice falling into the lake and producing big waves that hit the land. However, nothing compared to the reality. We were standing at one of the terraces gazing at the glacier when we heard a rumbling noise. Suddenly, a piece of ice had come off the main body of the glacier and fell into the lake causing other, smaller pieces to fall, producing a remarkable spectacle. We spent all day there waiting for other pieces to fall or just gazing at this wonder of nature and taking hundreds of pictures. 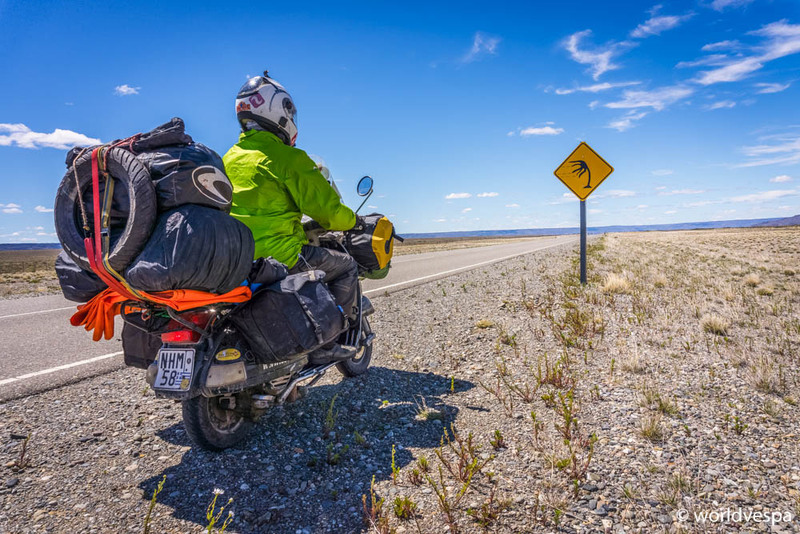 There was nothing else to do in El Calafate, so we hit the road again. 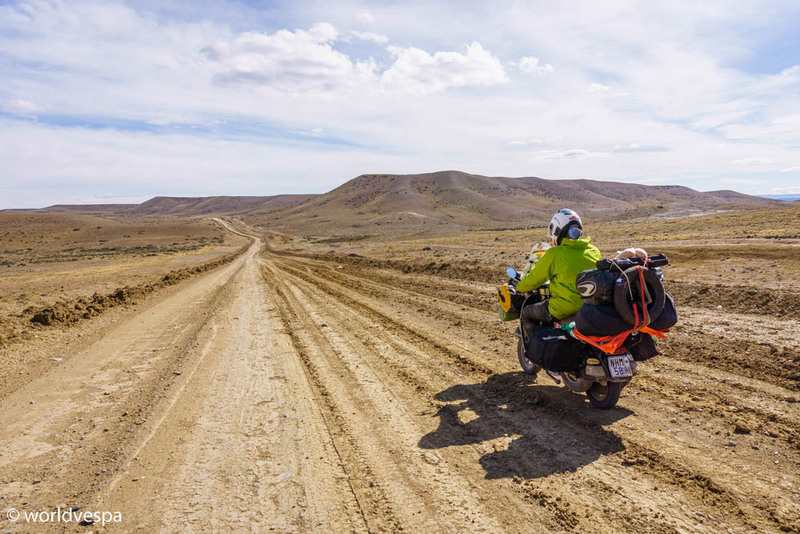 That day, we had decided to do 160kms until a place named Tapi Aike which consists of 3 buildings: the gas station, the police station and the Highways Administration office. Most of the 160kms we did were on the Ruta 40 on a cold and windy day. The last kilometers were on unpaved road and this was the most interesting part of the route. 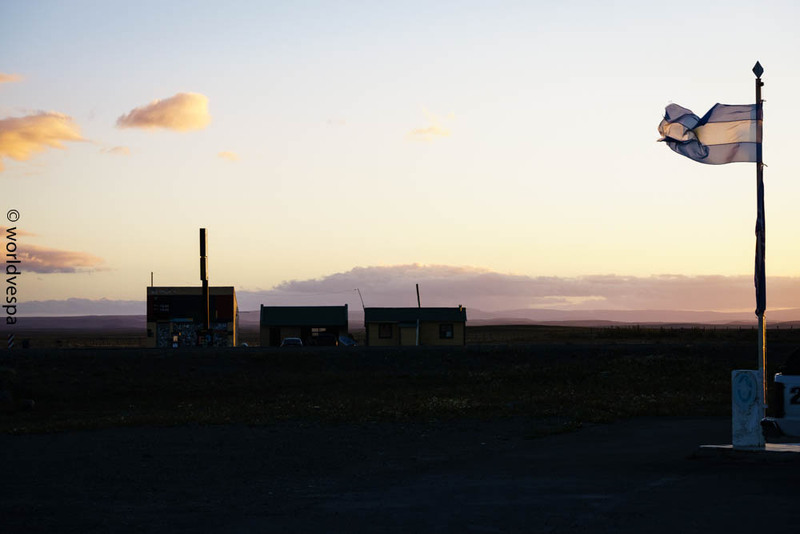 When we arrived at Tapi Aike, we went directly to the gas station and after we filled the tank, we asked if we could pitch the tent and spent the night there. The owner of the gas station gave us an alternative that proved ideal. He told us to ask Carlos, the person in charge of the Highways Administration office. Except for the office, the Highways Administration building is the house of the person in charge and it also has room for people who may be stuck in the snow during winter or in any other case of emergency. Since there was no one in need, Carlos offered us the extra room for the night, so we didn’t have to pitch the tent in the strong Patagonian wind. We had a wonderful time there. 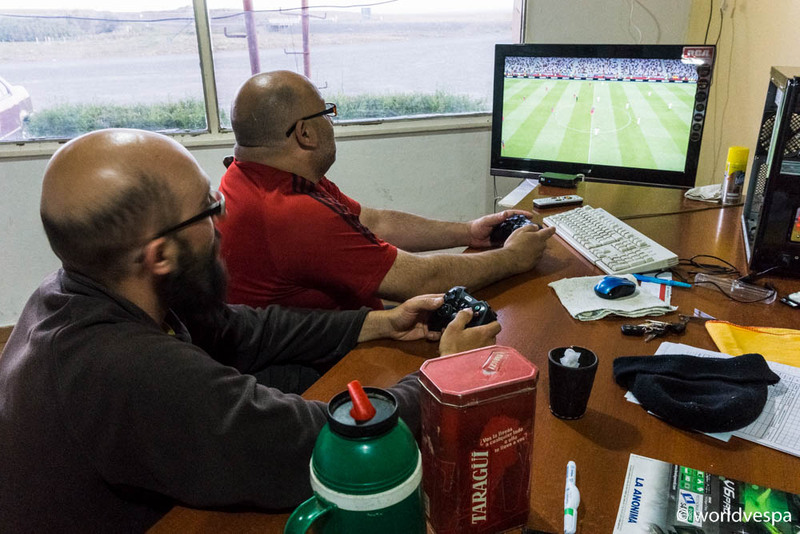 We shared dinner with Carlos and the two police officers and we even played foosball (a generous offer from the Argentinian State) and Pro Evolution Soccer, which kept Carlos company during his 15-day shifts. Later, after some liters of mate, we all went to sleep. That night the cold wind never stopped blowing and we felt relieved that we didn’t have to sleep outside. At the Highways Administration office in Tapi Aike, hosted by Carlos. Pro Evolution Soccer included in the accommodation amenities! The next morning, when we said goodbye to Carlos, we didn’t know how many kilometers we’d have ahead of us. After some serious thinking, we had decided to ignore Torres del Paine, the famous National Park of Chile with the amazing mountain peaks, the lakes and the forests. Despite having taken the visit to Torres del Paine as given already from the beginning of the trip, after taking into consideration some clues, we had second thoughts about it. 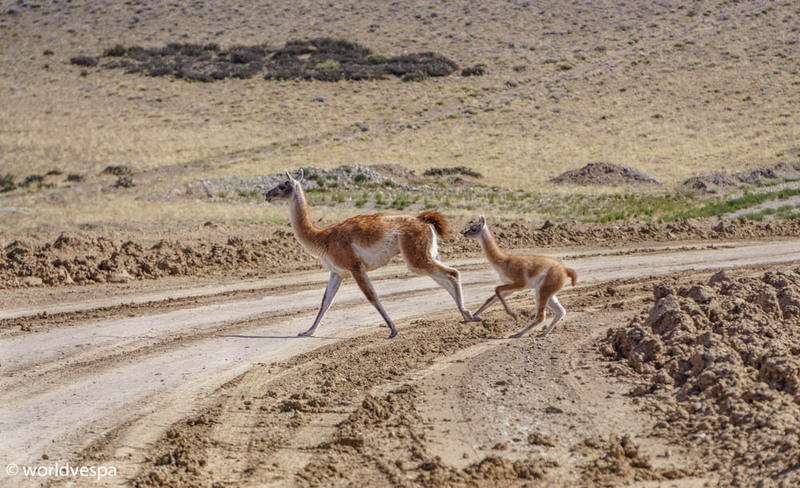 A few days ago we met an Argentinian family in El Calafate who gave us some tips for the Park. They told us not to act or look like tourists from the US or other places overseas, because we will be overcharged in everything. They suggested that I should speak with a heavy Argentinian accent and they even gave us info about which places to avoid due to overcrowding. All these information combined with some more we read on various sites on the internet made the idea less and less appealing. Additionally to this, we travel on a very tight budget, so we need to choose wisely between costly choices. Some months ago in Peru, we had avoided Machu-Picchu for similar reasons and we had chosen the trek to Choquequirao. 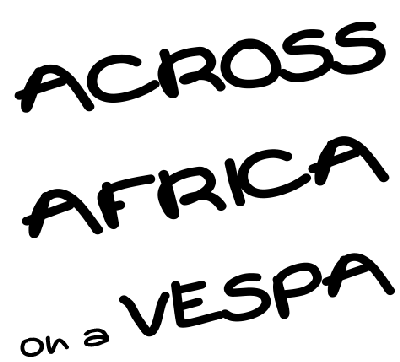 I saw your post on instagram and went to this website right away… I must say wowwww man, vespa? really, you two sir and madam are insanely amazing, I can’t believe you’re traveling by vespa, it’s just amazing and not common. well I guess in the end it’s not about the size of your bike but the size of your dream and will that matters. 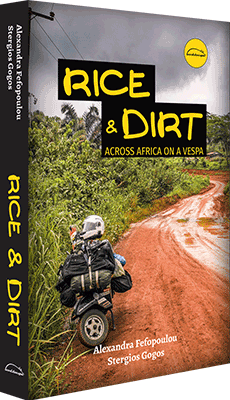 This is a great inspiration for me as I have been dreaming to ride my motorcycle around the world in the future. Maybe I borrow some of his photos for my tumblr, I can not help it, sorry, they’re incredible. Im from Tandil, a beatiful place in the center of Buenos Aires province. Coincidentally, my brother is working on El Chalten, he is a chef in a restorant called La Cava. I hope you have awesome trip, and a great life! Bye! Hello amigo, thank you for the comment! We wish you one day to follow you heart and one day make that dream travel come true!